Experience the sun, sand and surf at Australia’s most iconic beach, with this 1.5-hour walking tour of Bondi Beach. 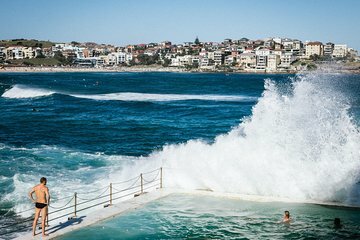 Learn about the area’s Aboriginal heritage, see where the famous ‘Bondi Rescue’ TV show is filmed and learn how Bondi Beach became a hotspot for tourists, celebrities and surfers. Along the way, admire the Bondi Aboriginal rock art sites; pose for photos by the Bondi Pavilion and take a peek at celebrity residences located nearby. Try your luck spotting celebrities or meet one of the lifeguards from Bondi Rescue! Great tour, Gregg was fantastic, very knowledgeable - scenery and history were fab.